This article will share the solution for C drive resizing when Disk Management was unable to add free space to it on Windows 2012. Download IM-Magic Partition Resizer Server to add free space to extend C drive when Windows 2012 cannot extend it under Disk Management. Failed to extend C drive under Disk Management when it runs on low disk space on Windows Server 2012? 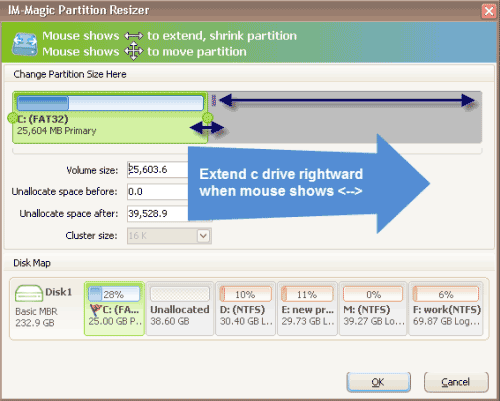 You can use IM-Magic Partition Resizer Server, which is a partition tool for Windows Servers to resize hard disk. This partition software enables you to add free space from any of partitions on the same hard disk to C drive. This partition software can work on all Windows Server operating system. You can increase size of C drive whether it has NTFS or FAT32 file system without rebooting your computer. Only about four steps are needed in order to extend C drive on Windows Server 2012 by using this partition software. "There is little free space left on C drive on my PC which runs Windows Server 2012 operating system, so I run Disk Management to move some free space to extend the C drive. I open Disk Management and shrink a volume that has lots of free space and get some unallocated space. However, when I attempt to add the unallocated space to C drive, the Extend Volume option is grayed out. How can I add the unallocated space to C drive when Extend Volume under Disk Management is grayed out?" "Windows Server 2012 says that C drive is running out of disk space. How can I extend the C drive space when Disk Management was unable to resize the disk? Is there any influence if C drive keeps running on low disk space? If anybody has encountered the similar problem, please tell me the solution. Thanks for your help!" Partition software is a good choice if you want to add free space to C drive when it is running out of disk space. Usually, C drive is also known as system partition. If you cannot get a secure way to resize C drive, it may affect the operating system. IM-Magic Partition Resizer Server, as a partition magic for Windows Server 2012 and other Servers, provides safe way to resize hard disk without touching operating system on Windows Server 2012 and other Windows Servers. 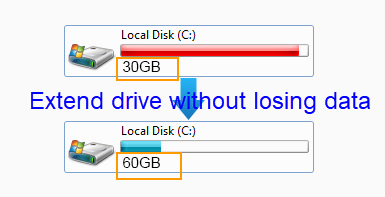 You can increase the size of C drive without reinstalling system or reformat disk. You just need to move the mouse and perform a few mouse clicks to extend C drive space without touching any data on the disk. Why "Extend Volume" Option Is Greyed under Disk Management? It is true that Disk Management on Windows Server 2012 is able to extend and shrink disk volume, but why the "Extend Volume" option is grayed out when you want to add the unallocated space to the partition that runs on low disk space. Well, before you can add free space to a partition, you need to shrink a partition to squeeze some unallocated space first of all. When you shrink a partition, the unallocated space will display behind the partition you shrink. If you want to add the unallocated space to C drive, you still need to move the unallocated space close to C drive. The "Extend Volume" option will be grayed out if there is no adjacent unallocated space beside the C drive. When Disk Management was unable to extend C drive because there is no adjacent unallocated space, you can use partition software IM-Magic Partition Resizer Server to reallocate disk space. This partition works similarly as Disk Management, but it enables users to move partition. Therefore, you are able to move the unallocated space close to C drive after shrinking a partition. You can use this partition software to resize basic hard disk and RAID 5 disk when C drive is running out of disk space.